The river that borders Smurfy Grove has suddenly dried up! Not a drop remains! Now, it's up to the Smurfy Grove Smurfs, accompanied by Hefty Smurf, Brainy Smurf, and Clumsy Smurf to get to the bottom of this strange drought! But, the answer might lie within the group. Does Smurf Blossom know something she isn't smurfing? 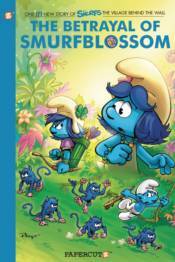 All this and four more thrilling stories inspired by the hit feature film, Smurfs: The Lost Village!